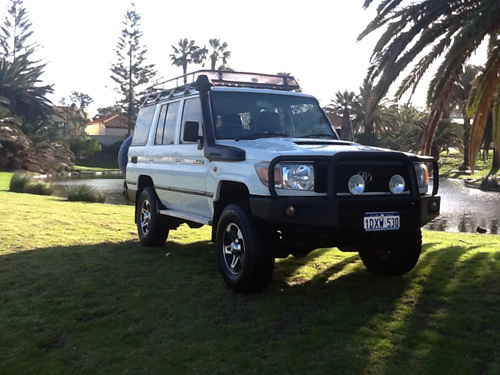 Fantastic V8 four wheel drive for the ultimate Aussie off road adventure. 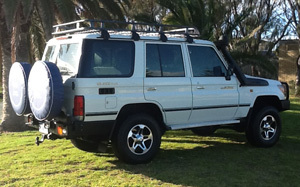 Perfect for small groups or families, this powerful 4WD seats up to 5 people. Get ready for adventure! All camping gear is supplied. You can camp out in the bush, under the stars or camp in luxury with our 4WD + Camper Trailer combo deal. Sleeping FREE tent/sleeping gear supplied with this 4WD. OR Hire a trailer with this 4WD! Fuel Capacity: 1 x 90 litre tanks. Linen, pillows, sleeping bags supplied. All camping gear supplied.